The American Nuclear Society has presented SGIS Distinguished Scholar and longtime U.S. Senator Richard Lugar with its Dwight D. Eisenhower Award, recognizing achievement in the area of nuclear nonproliferation. Susan Eisenhower, the president’s granddaughter, presented the award in a ceremony at the organization’s winter meeting on Monday (Oct. 30) in Washington, D.C. The American Nuclear Society first gave out the Eisenhower Award in 2014 to honor individuals who have made outstanding contributions to the advancement of nuclear nonproliferation. Lugar was honored along with his partner on groundbreaking nuclear nonproliferation work, Senator Sam Nunn. Siegfried Hecker, the former director of the Los Alamos National Laboratory, also received the award. 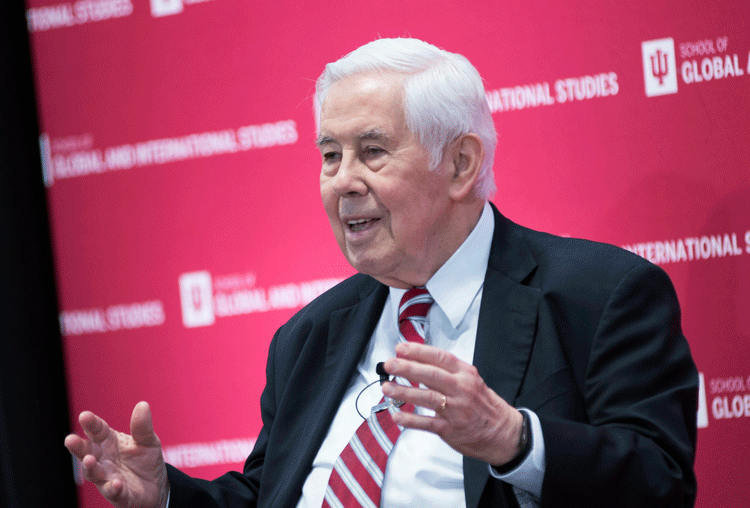 Lugar has long been a leader in promoting global security through his work in the U.S. Senate and since leaving Congress. He and Senator Nunn co-authored the Soviet Threat Reduction Act, signed in December, 1991. The legislation established a program to aid former Soviet states in dismantling their nuclear arsenals and weapons of mass destruction after the end of the Cold War. Based at the Defense Department's Defense Threat Reduction Agency, it is considered one of the most successful postwar foreign policy efforts since the Marshall Plan. To date, the program has deactivated more than 7,600 nuclear warheads, neutralized chemical weapons, safeguarded fissile materials, converted weapons facilities for peaceful use and redirected the work of former weapons scientists and engineers. Belarus, Kazakhstan and Ukraine are nuclear-free and Albania has eliminated its chemical weapons as a result of the program. The program has evolved as the Cold War has receded, spreading its reach to more than 40 countries and working with partner nations to mitigate the threat of biological and chemical weapons as well as the potential for unsecured nuclear materials. Lugar, a fifth-generation Hoosier and the longest-serving member of Congress in Indiana history, is recognized as a gifted local leader as well as a respected national and international statesman. During his tenure in the Senate, from 1977 to 2013, he exercised leadership on food security, nuclear nonproliferation, energy independence and free trade. A former two-term mayor of Indianapolis, he currently leads The Lugar Center in Washington, D.C., a nonprofit think tank established to address global issues in the 21st century.